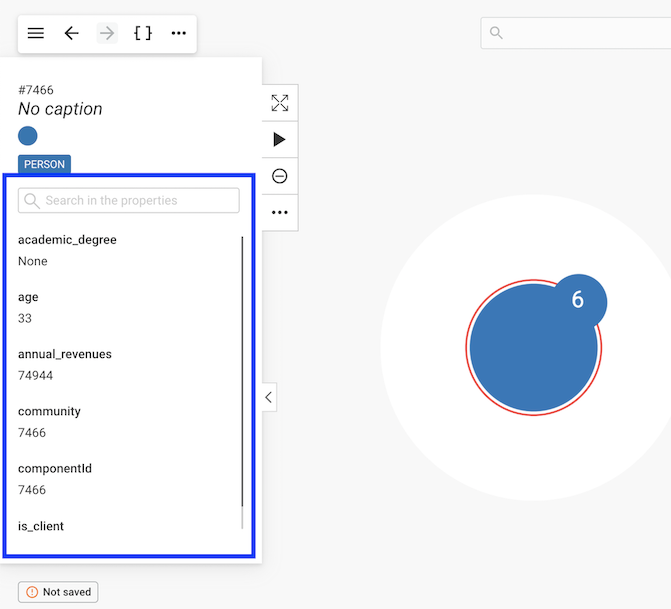 In order to view the different properties of a node, we click on it. Information immediately appears on the left side of the screen. Here we can see that there is a node with the id #26389. It is called Instagram and has a Company category. Below we can see the various properties associated with the node. For example the node has a country property with the value USA. We can scroll down to see more properties or use the search bar to find a property. Notice the number next to the node, it is the number of undisplayed edges. Inspect edges in the same manner. Time to find out about the particular edges of a node. The easiest way to get that information is to double-click on the node we are interested in. Here we are interested in Instagram. Now we can see some nodes that are connected to Instagram. Notice the white halo around each node? All the nodes surrounded by the white halo are connected to the currently selected node (or nodes). In this case, all the nodes are connected to Instagram. The lines between the nodes represent the edges. All the edges have a direction from one node to another (represented by an arrow). If we click on a given edge, the properties of that edge will be displayed in the left panel.